Production views are used in a deployed environment. 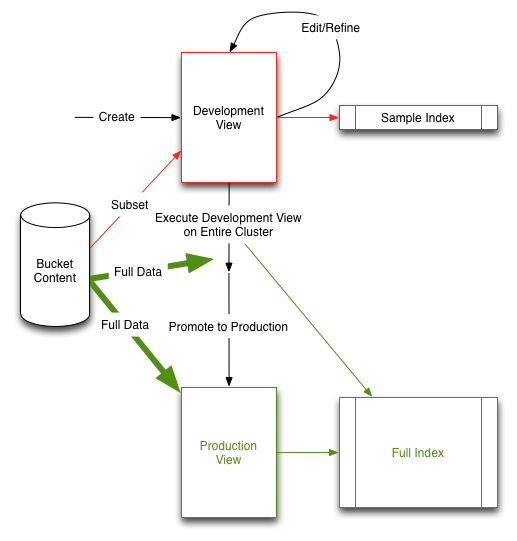 Production views always operate on the full dataset for their respective bucket. Production views can either be created from the Web Console or through REST API. From the Web Console, you first create development views and then publish them as production views. Through REST API, you directly create the production views (and skip the initial development views). Production views cannot be modified through the UI. You can only access the information exposed through a production view. To make changes to a production view, it must be copied to a development view, edited, and re-published. Views can be updated by the REST API, but updating a production design document immediately invalidates all of the views defined within it. Production views are accessed through a different URL to development views. Create a development view and view the sample view output. Refine and update your view definition to suit your needs, repeating the process until your view is complete. During this phase you can access your view from your client library and application to ensure it suits your needs. Once the view definition is complete, apply your view to your entire Cluster dataset. Push your development view into production. This moves the view from development into production, and renames the index (so that the index does not need to be rebuilt). Start using your production view. Individual views are created as part of a design document. Each design document can have multiple views, and each Couchbase bucket can have multiple design documents. You can therefore have both development and production views within the same bucket while you development different indexes on your data. For information on publishing a view from development to production state.